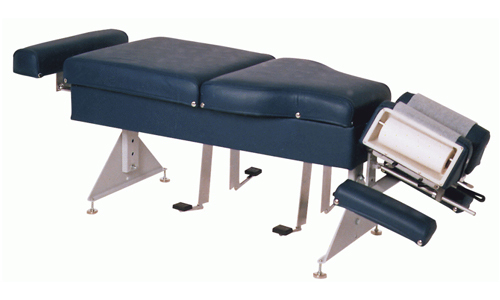 The 401 DB Chiropractic Table is an adjusting bench with a total drop system. Standard features include a tilting forward motion drop headpiece with adjustable widths, one-piece chest/lumbar drop and lumbar/pelvic drop. Options include an elevating headpiece with straight drop, kick drops and ankle drop.